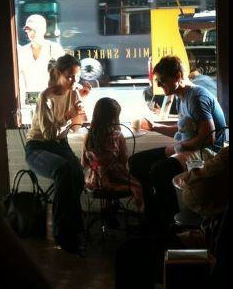 Suri and TK made a trip to the Milkshake Factory in Pittsburgh on Saturday, 24th. 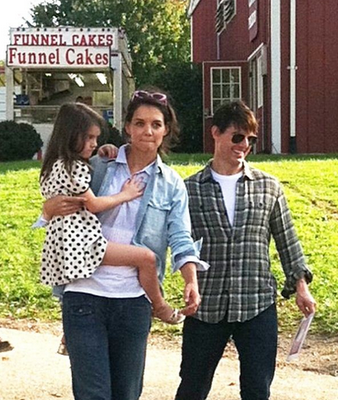 The family was in town for the weekend to visit Tom while he films his latest movie, "One Shot." "Katie ordered a vanilla salt caramel sundae for the group," a fellow customer at the Milkshake Factory tells Life & Style. "They also ordered three 20-ounce milk shakes, and Katie said they were going to share all three so they could taste the different kinds. Suri also got a plain vanilla cone!" "They got a classic chocolate made with vanilla ice cream and chocolate syrup," the customer adds. "They also got an Oreo shake and the flavor-of-the-week shake, which was apple pie. It has cinnamon-apple-pie pieces." 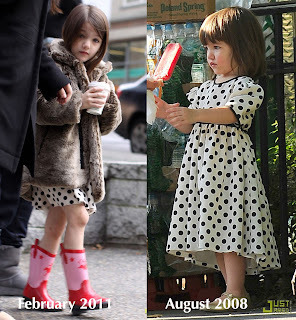 outfit: its really hard to make out which dress Suri is wearing... looking for better pictures. Suri was first spotted wearing Gold Sandals (model 6/A0088) by A Line Footwear, while out on the beach with Katie on May 30th 2011. Thanks a lot for the info to Amy Buckner from A Line Footwear for Kid Girls. Suri's model is sold out online, for ordering contact sales@amianaltd.com. 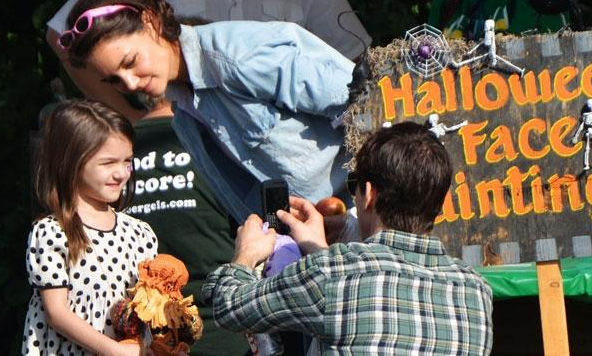 Suri got her face painted! one of Suri's favorite brands - Juicy Couture has just released their FW'11 shoes collection! 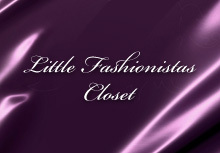 Shoes with heels are included as a party-wear for Little Fashionistas! 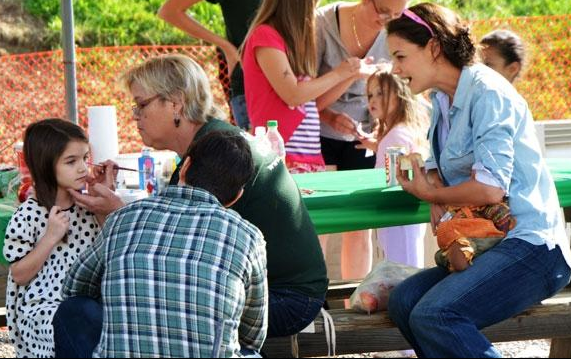 Suri & TK spotted at Soergel Orchards Family Farm Market in Wexford Sunday, 25th. Tom is in Pittsburgh to film a new action-thriller movie, "One Shot." According to the Pittsburgh Film Office, filming will take place in and around the city from early October through the end of the year. more pictures THANKS to Amy! outfit info: dance wear shoes. on September 22nd, Katie and Suri were spotted at Ross Park mall in Pittsburgh. They stopped at the Cheesecake Factory. 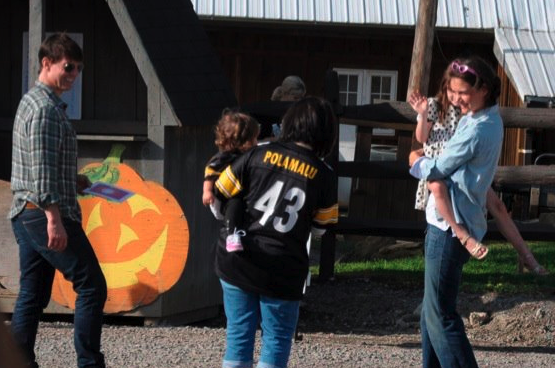 Who Wore Hello Kitty Rain boots Better - Suri or Tabitha? Suri Cruise paired her HK Rain boots by Western Chief with a reversible Reversible Floral Tshirt Dress (no id), while out shopping in Toronto on August 22nd 2010. Tabitha Broderick opted for a comfy look paring her HK Rain boots with Polka-dot Loungewear set from AW11 Collection by Bonpoint, while out with her family in NYC on September 9th 2011.
imho - both looks are ill-fitted for wearing outside.. but the boots are really cute! Suri & Katie went to a Post Office in Brentwood, CA on Friday, 16th. outfit info: piggy backpack by beatrix, drop-waist pink dress by crewcuts. Suri is wearing Lurex Knit Cardigan in Jewel by SEED, (first wore on October 4th 2009) and Purple Tangled Slippers by Disney (first worn on March 16th 2011). Suri was leaving their NYC apartment en route to gymnastics class at Chelsea Piers on Thursday 8th. 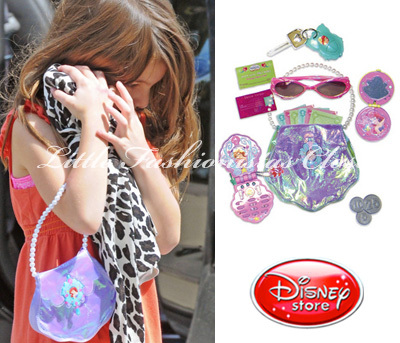 Suri was holding Ariel Fashion Purse by Disney. 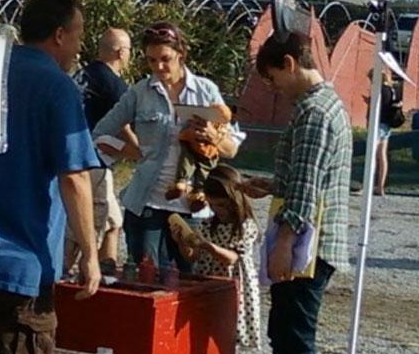 Suri is wearing Asymmetrical Ruffle Dress in Orange from Sunset Collection by GAP, wich she first wore on May 31st 2009. 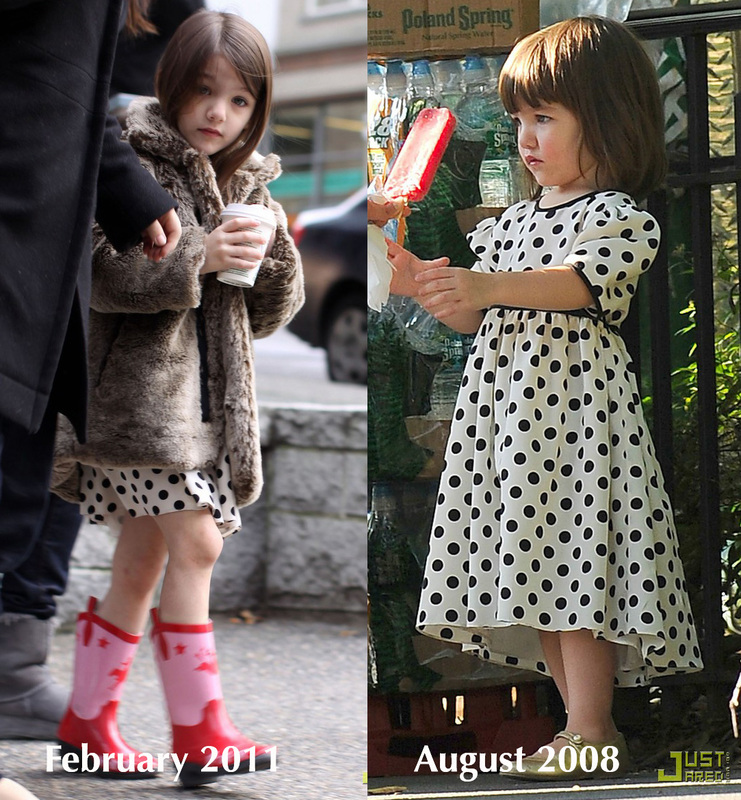 Suri was wearing Navy Eyelet Dress from Kid by Phillip Lim. Thanks to Natalia for the info! S&K were spotted leaving pre-shool building in Beverly Hills on Friday, September 2nd 2011. 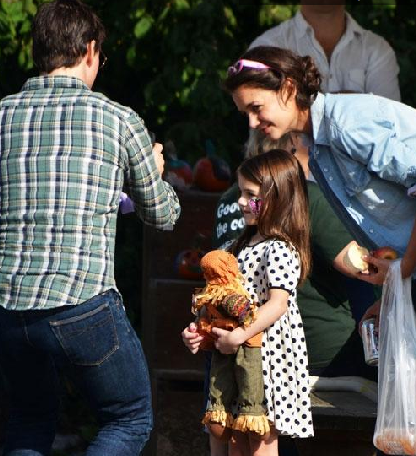 Katie was carrying Suri's Piggy Backpack by Beatrix NY. 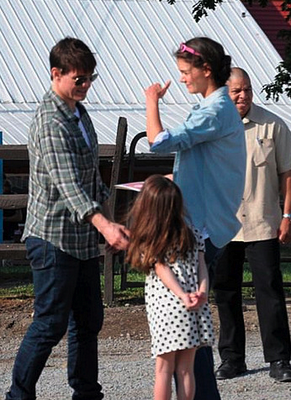 Suri was also wearing Silver Ballerina Shoes by Repetto (frist worn on July 26th 2011).